Categories: Aqua / Turquoise, Gold. While many weddings carry a traditional style, some couples are looking for something a bit more personal or a style which resonates more strongly with them. 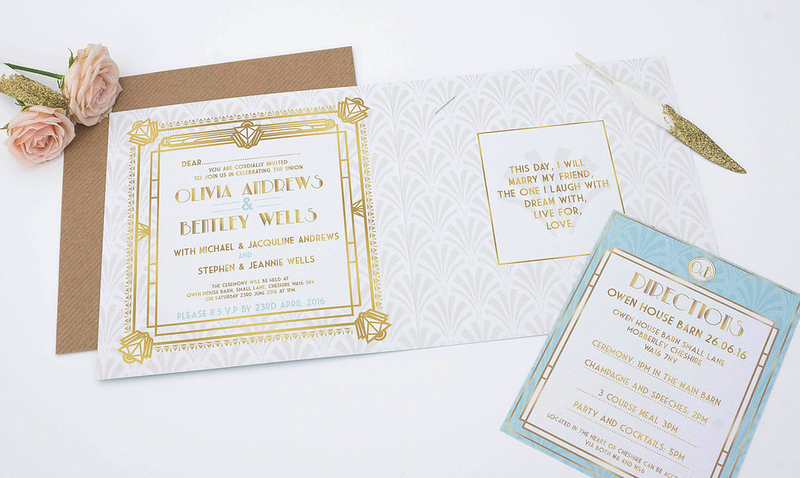 When you think about traditional wedding invitations and themes, the nature is demure and welcoming. It would be fair to say that the Art Deco style is a bit bolder and possibly even brash to be used for the standard wedding invitation but for couples who appreciate this style and who know exactly what they want, the Long Time Ago wedding invitation is a great invitation. The 1920s have been recognised as a roaring time of fun and great freedom. The period between the two World Wars were tough in many ways but there was also a decadence and excitement about this era. When it comes to throwing a party that people will remember, harking back to this time is the ideal way to let people know that they will be coming to an event where they can let their hair down and have some fun. The clean and crisp lines and shapes of this design style leads to a simplistic and charming invitation and the blend of Tiffany blue and gold with white ensures that you have an invitation that is like no other. As well as informing people of what to expect at the big event, a wedding invitation should have a charm and presence of its own. The Long Time Ago provides all of the relevant information that guests need to plan for a wedding but the style and nature of the invitation makes sure they know that they are set to have a great time when the wedding rolls around. Order from Hertas Creative Design. Tags: 1920s, Art Deco, Tiffany Blue.